ALIQOPA (copanlisib) is a kinase inhibitor indicated for the treatment of adult patients with relapsed follicular lymphoma (FL) who have received at least two prior systemic therapies. Please call at M: +91 9891296838 to buy and know more details about the FDA approved generic ALIQOPA (copanlisib) medicine available in India and its cost price. Copanlisib is a drug which is approved by US FDA for the treatment of adult patients experiencing relapsed follicular lymphoma who have received at least two prior systemic therapies. Copanlisib has been shown to have an effect against survival and spread of cancerous B-cells. 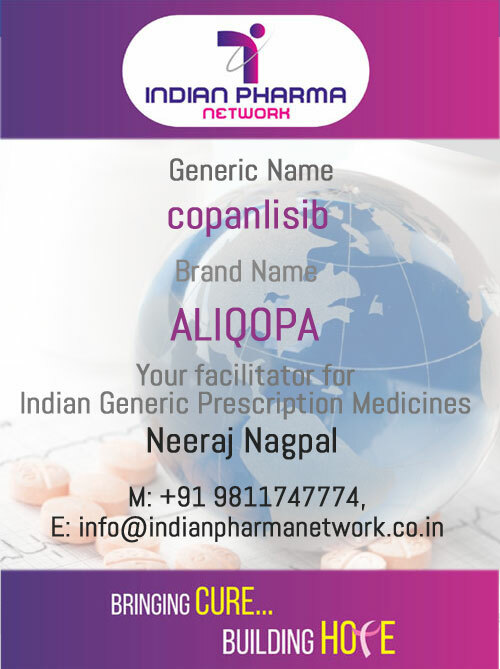 IPN helps patients, doctors and hospitals as a facilitator to import prescription medicine brand ALIQOPA (copanlisib) for injection) on prescription and Import License in Patient's Name only. For Aliqopa Injection or generic Copanlisib in India. Please call at M: +91 9811747774 or Email Us to know more details about the medicine and its cost price in India. For Indian Patients, doctors and hospitals ALIQOPA (copanlisib) for injection) can be made available to patients, doctors and hospitals at Mumbai, Kolkata, Hyderabad, Chennai, Ahmedabad, Delhi, Bangalore, Srinagar, Jammu, Jaipur, Chandigarh, Ludhiana, Noida, Gurgaon, lucknow and Pune and other cities in India. The order will be confirmed only after the receipt of valid prescription of doctor and import permit if applicable. For injection: 60 mg as a lyophilized solid in single-dose vial for reconstitution. Indian Pharma Network specialize in Medicines | Drugs related to Cancer Chemotherapy, Gastroenterology, Bone Marrow Transplant, Neurology. Helps patients, doctors and hospitals as a facilitator to import prescription medicine on Import License in Patient's Name only. 60/4, T&T House. Yusuf Sarai. Inside Indian Oil Building Compound. Call Us: +91 9811747774, 98912 96838.